Join us for a complimentary tasting, a Farm-to-Glass Tour, or a personalized private tasting. We pride ourselves on providing fun, friendly, and educational service to all of our guests. Come on over to enjoy our award-winning wines with great company. Check out our award-winning wines, and get a case...or four...or more! Did you know? Sangiovese is the only grape varietal named after a god. The root of the word comes from the latin words "sanguis" and "jovis" - meaning the "Blood of Jove." The Roman god Jove was the equivalent of the Greek god Zeus. Check out our list of upcoming events, or plan your next event at Vino Noceto. From barbecues to concerts to seminars - check the events calendar for our latest events. Want to plan your own event at Noceto? We have a space for every occasion. 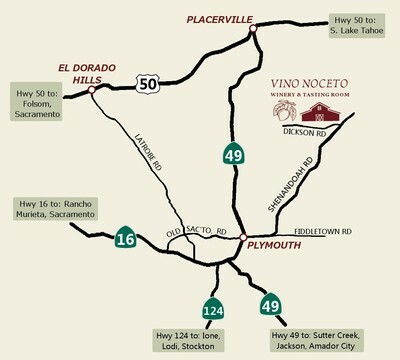 Vino Noceto is where Italian inspiration collides with California sunshine to produce world class Sangiovese. Join us at our winery in beautiful Amador County, California, and come share our passion for wine.